This plate is now available and is in beautiful condition, it does have a minor glazing flaw to the front and priced accordingly. I took the description from my Meissen Gallery section. The plate is a very attractive example and a nice addition for the "Forestry/ Hunting" Collector. For well over a century Meissen has issued commemorative plates for important historic events. Among the most favored were those manufactured to commemorate the history of Saxony's regiments and other military establishments. This particular piece celebrates the centennial of KÃ¶nigl. SÃ¤chs. 1 JÃ¤ger-Battalion Nr 12's establishment. The unit was the senior of the two Saxon JÃ¤ger-Battalions, both formed in 1809, during the height of the Napoleonic Wars. KÃ¶nigl. SÃ¤chs. 1 JÃ¤ger-Battalion Nr 12 garrisoned at Freiberg, where it was attached to the Saxon XII ArmeeKorps. Although the main focus of this site is 3rd Reich, I cannot help but to reach out on occasion to grab an exceptional piece outside of that era, and will eventually spread out to capture pieces that are worthy of mention. The plate is hand painted in a light green with shades of black, green was the primary color of all JÃ¤ger-Battalions. 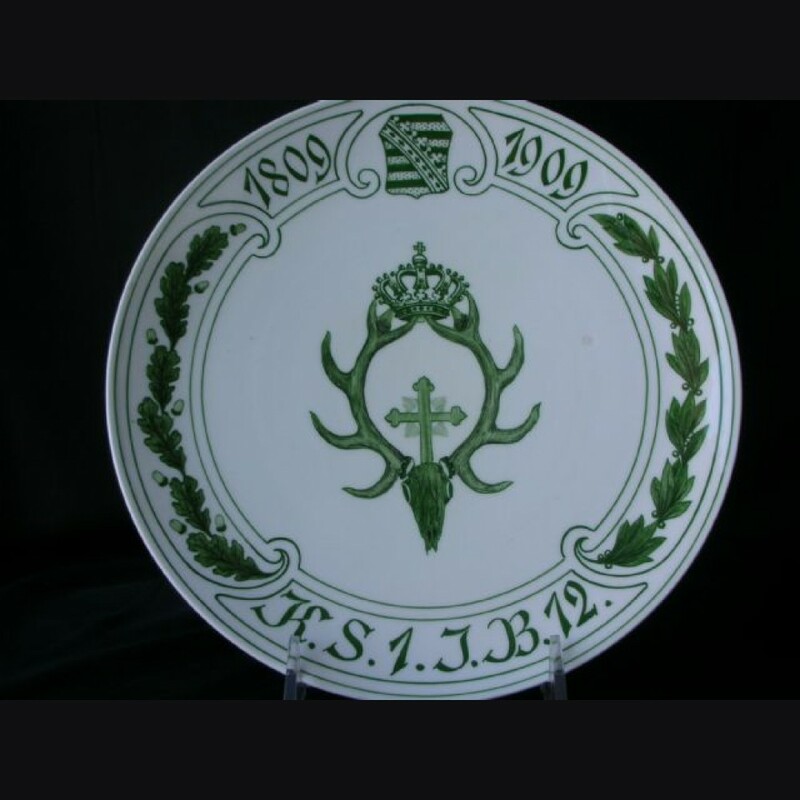 The top of the plate bears the dates 1809-1909, which represent the centennial of the units establishment. Between the dates is the Saxon Coat of Arms. The center of the plate features a stag's skull and antlers, emblematic of the JÃ¤ger-Battalions. Above the skull is a cross, and set atop the large antlers is the Kingdom of Saxony's crown. On the left and right of the plate are oak leaves with acorns and laurel leaves with berries, and to the bottom are the letters K.S.1.J.B, which stand for KÃ¶nigl. SÃ¤chs. 1 JÃ¤ger-Battalion Nr 12. The rear of the plate has the typical and unmistakable crossed swords of the centuries old Meissen firm. Being 100 years old does not show in the slightest, and it is of the highest quality and a real looker. Meissen JÃ¤ger-Battalion Nr.12 Saxony Centennial Plate.